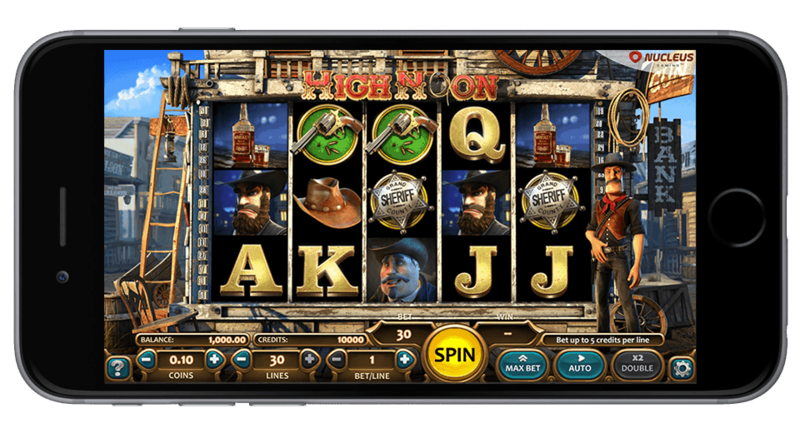 High Noon Slot Review - Play this Western Slots Game FREE! Developed and released by Nucleus Gaming, High Noon Slot machine is fully packed with amazing 3D graphics and animations ensuring a high level of entertainment. 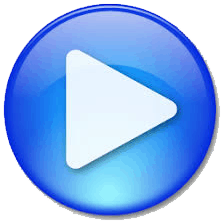 The online video slot is presented to players in 5 reels and 30 paylines and it offers a various coin denomination starting at 0.02 and going up till $1.00. High Noon slot game allows you to activate the number of paylines you wish setting the maximum bet at 150 meaning you can wager maxim 5 coins per active payline. You can enjoy the auto-play feature and let the game spin for you but also you can gamble all your wins by pressing the double-up button. In general, High Noon Slot has a rather average variance offering you regular chances to earn great payouts. 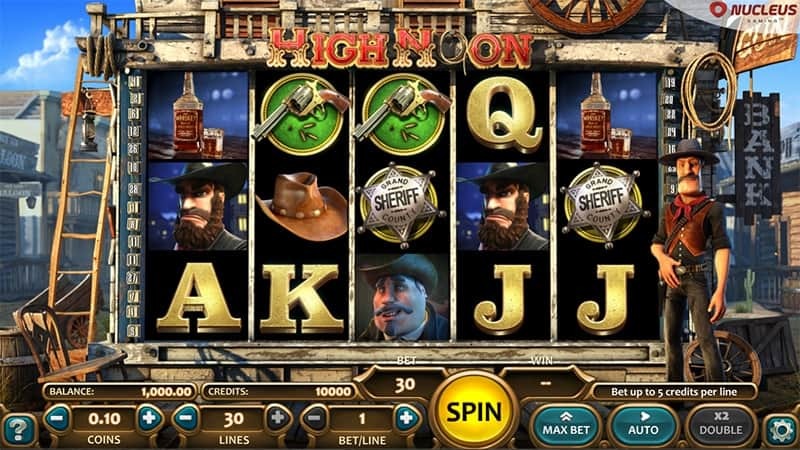 High Noon Slot theme is a Wild West shoot’em up slots game. The main character in this 3D slot, The Sheriff stands to the right side of the reels, joining you as you spin the richly-animated reels. You are taken on an amazing journey to the Wild West where you can you can trigger some incredible wins and help the Sheriff maintain the peace in his town. The reels are standing in the center of a dusty road, between the saloon and the lender. The background is filled with incredible details, all in 3D, making High Noon Slot feel very lively right from the beginning. 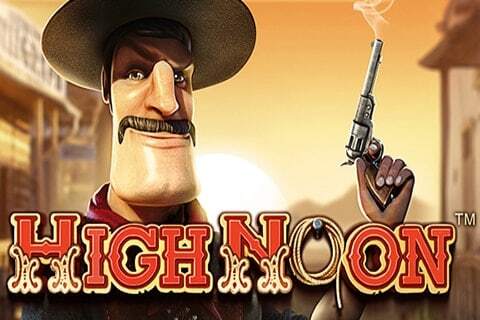 High Noon Slot has an exciting game-play filled with great bonus rounds and free spins and Wild and Scatter Symbols. The theme-related symbols on the reels include whiskey bottles, cowboy hats and regular ones such as card symbols. Its bonus features are completely original. The Sheriff’s badge symbols represent the Scatter and helps you trigger the free spins round. To trigger the free spins feature on the High Noon Slot, you must land 3 Scatters on the reels. You will receive 10 free spins and during this round each Sheriff badge that lands on the reels will be added to a badge counter. When the Free Spins feature ends, the badges are calculated and become further payout to be added to your winnings. The Showdown Bonus Round in High Noon Slot is triggered by landings the pistol symbols between the Sheriff symbols and the villain symbol. You will be transferred to another screen and get to pay a coin toss game to determine to size of your cash prize. If you manage to land the Wild Gun symbols on the 3rd reel the Sheriff will go on a shooting spree hitting up to 5 symbols on the reels. These symbols will then be transform into wilds and instant re-spins occur. The High Noon slot game is a mobile friendly Nucleus slots game available to be played on ipad, android or iphone devices. Our slots review team always enjoys a Western themed slot game like High Noon Slot. It takes us back to the origins of US gambling in old small western towns. In summary of our review, High Noon Slot does not dissapoint. With great 3D graphics and very entertaining Free Spins and Bonus Round this game is well recommended. Casinos Online Review receommends this online slot machine to any Wild West lovers. 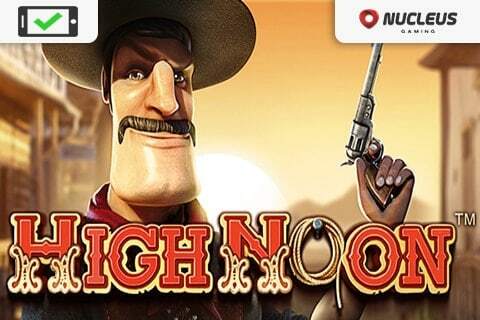 So step into this gun slinging world and play High Noon Slot for free in our casino GAMES ROOM or test your skills for real cash at one of our top listed Nucleus Casinos below.